A writing project, to which we add thousands of words all the time, every day. Now in its tenth year, not having missed a day, in well over three thousand days. I've always felt compelled to write; I don't know, does that show up anywhere else around here? If so, I'll try to link, and all that. I've often contemplated being a "journaliste" - in the sense of writing it all down, as a journal. I once read a fine journal of a year on a farm, Hal Borland's Book of Days, in which Mr. Borland, a fine writer, detailed each day of a year. I liked the idea of something entered every day, and not just as a diary, but with a broad view; document the inevitable natural miracle one encounters every day, as well as the lofty ideals and lowly vicissitudes. I've endeavored, in my long-and-checkered, to write daily, and have some nice notebooks with pages and pages, and some really nice stuff, along with the crap, which is what most of it is... but we always say that, don't we? And I always, I am somewhat chagrined to reveal, seem to to start these ambitious, daily-writing endeavors on the first day of a year; on 1 January. Although I notoriously eschew New Year's Resolutions, I still apparently have found the onset of a year useful, and a few times, have begun a daily writing exercise. I kept a great notebook from around 1990, written long-hand, but petered out, as usual, by mid-March. Clearly, the hangup was not being able to type, and not having a typewriter - this includes the days before personal computers, and I even had one - an IMB PC - the tiny hard drive of which I've written - but I lacked a typewriter, and the skill at tickling the keyboard the right way. I began typing in 1991 (documented at 23crows.com), but still didn't have the daily habit, until something clicked in when 2004 came around, and I had a nice desktop PC by then, with a hefty hard drive and all that (up to two laptops and an even heftier desktop), and began writing, with the intention of writing something every day. I also have a venerable and inscribed copy of David Ossman's Daybook of the City, published by Turkey Press in an edition of 150, and which is, by far, the handsomest and finest volume of poetry that I have yet encountered. So being a "journalist" is to be one keeping a "daybook," so on day one of 2004, I began my journalistic endeavor: write every day; my fundamental and only goal. As mentioned above, I generally would begin such a thing - which I have done a handful of times, say half-a-dozen - with the best intentions. I would find a way to sit down every day and do the thing, but, as I said, I would always lose steam by the spring. I was trepidatious about that; when March rolled around, after having kept it up at the desktop PC, I wondered if I was going to actually keep it up, or stick with my usual pattern of realizing, after a couple of weeks, that I wasn't writing every day any more. I had developed the habit of writing every morning, before anyone else was up. At the time, my son was in school and rose around 6:45, and my wife, living with me then, got up around 7:30, so I'd rise at 5:30 and do my thing. Oh, in those old days, I had to look at the keyboard while I typed, and I made plenty of errors (but with word-processing software these days, I have it easy, as it corrects some of my general mis-types as I go), but I kept at it, proudly knocking out five hundred words a day, on a good day. And March 2004 rolled around, and I had been on this iteration of the daily-writing expedition since the onset of the year, and I kept going. The following year, having made it a full calendar year, I found myself traveling to northern Germany, land of many of my forebears - in the winter, early 2005. I had been accustomed to writing every day, but worked with a desktop machine, and didn't have a laptop. My word count average at the time was around eight hundred a day, I think, so I stocked up with paper in my old aluminum notebook (Passepartout, I call it, after Fogg's manservant), and wrote my way, by hand, through northern Europe. There are a number of pictures of me, taken by German friends and put on a disc, and in most, I'm writing away, with my pen and paper and my notebook. I've been typing all this time - except for the time I was in Europe in the pre-laptop era, and wrote by hand (thirty-thousand in two weeks, and I eventually typed those pages into the file) - and haven't missed a day. The goal was always, and still is, to type every day (and notice I refer to it as "typing," rather than "writing" - it takes off some of the pressure) - I didn't have any official word count goals. I can recall with delight when I hit 100,000, back on 22 June 2004, in the first year of the project. And at the end of the year, delighted with my achievement - having satisfied my goal of typing daily, never mind counting the words - I was able to report that I also had generated 312,850 words. My report met with crickets, but that had more to do with my wife, who never much enjoyed my New Year's Eve company anyway. I kept at it, and hit a million words nearly two years after that, close to the end of 2006 - three years into the project. At that time, the word count average wasn't bad; I was proud of doing a bit over nine hundred words a day - on average; some more, some less, naturally. The enduring mandate, though, again - of course - was merely to type daily, rather like being told, "Eat a lot of oysters; never mind how high the pile of shells becomes." Well, I like the view from sitting atop this massive midden of oyster shells, let me tell you. I make allusions, though, here and there, to my riding along with such irony as a constant companion. This is indeed true, and always has been - I'm a writer - come on, I'm addicted to irony - but not to the barrage which it has become (seems that I'm mixing that metaphor a bit?) in this year, of 2010. I've had much about which to write this year, to the point that I can barely more than merely allude to it - but domestic shake-ups, Shakespearean perils, and personal odysseys attempting to navigate in close proximity, surrounded by treacherous reefs� But this daily discipline - a practice, to consider it in a monastic sense; discipline, disciple - has been, over the last several years, my navigation support. Couldn't have Argonauts without an Argo, to bring some other Greeks onstage; it's been a nice constancy in my own odyssey, about which I have much more to write. Part of what I'm writing about in my writing-about-writing (meta-writing!) is what a faithful companion it's been, like a long piece of line anchored to the cliff with the narrow ledge to traverse. I can keep a hand on it, and know that as long as I keep walking, it keeps stretching out ahead of me, and keeps me safe. �which also liberates the subconscious to go in and do the deep shamanic work. About which - there is much more to write. I generate it with good old Microsoft Word - which has its detractors, but I'm not one, having found it to be an excellent and customisable bit of software; it's certainly more dependable and useful than my wife ever was, and much cheaper, too. I type it up, rendered in 5.5pt Arial, which reads just as tiny as the image above. 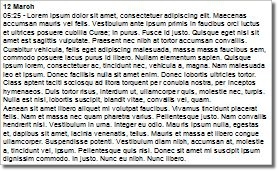 When typing it, I view it at 150%, so I can read it - and I still need my reading glasses. Each page is rendered in two columns, to keep the lines not too long, and easier to scan. Here's another sample, but of the actual output - the first twelve pages of 2011, which covers up to 9 January. I added page numbers to the image, and the little red plus signs indicate the onset of a new day of working at it. 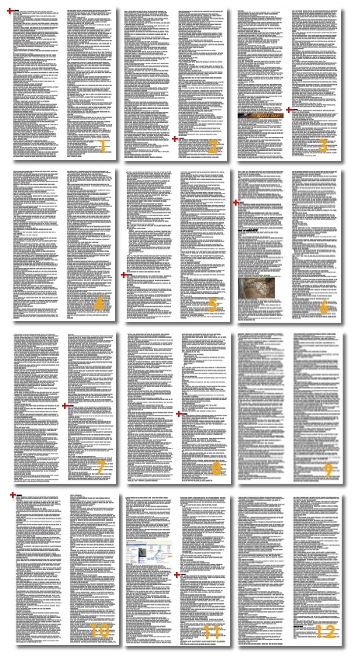 Each page represents about 2,500 words; my daily average hovers around 3,500. The sample is 28,424 words. the daybook archives are maintained offsite and redundantly in a decommissioned silo in either Nebraska or Indiana, in digital (xml) and printed media. We think it's a "missile silo," but didn't want to risk disappointment, so didn't ask – in case it's merely a decommissioned (read: "abandoned") grain silo, with rats and other vermin all around... in which case we can say goodbye to the printed archives, and likely the sheathing on the server cables... ah, well – will just keep writing and hope for the best.